Pique passerby interest & increase open house traffic with a high-quality real estate sign. 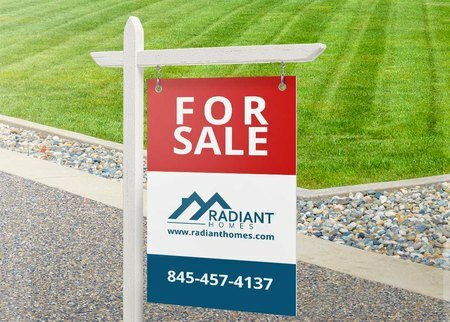 Real estate signs aren’t just there to sell your property or announce an open house. Every sign represents your brand and conveys the lifestyle potential homeowners are looking for. 18” x 12” is the smallest sign available, perfect for “for sale” messages. 24" x 18" has a longer length and more space for your company name, logo, and the 'for sale' text. Aluminum that doesn’t rust and can last at least 5 years on outdoor display; printed in matte or gloss lamination. Reflective aluminum comes with gloss lamination which makes your design extra vibrant. Corrugated plastic is another outdoor solution that is also waterproof and UV printed for protection. You can also add grommets or holes on two or all corners to secure a hanging sign. Have your real estate sign printing done with us today. Our print experts are available for any questions you may have about your order. Use our real estate sign layout templates to ensure your artwork is sized and formatted correctly. PrintPlace layout templates can be downloaded for each standard size label below, in an EPS, PDF, or JPG format for Illustrator or Photoshop.